EAS change systems, at Hall 27 – Stand G42 of the EuroBLECH exhibition in Hannover, offers multiple solutions helping companies improve their equipment effectiveness using SMED, Single Minute Exchange of Dies. One of the product lines in the extensive portfolio is the series of pre-rollers -motorized, fixed or swiveling. Next to the motorized pre-rollers, hydraulic clamps, single clamps and manual tool change carts are demonstrated. With the MDCC demonstration unit, dies or casts will be loaded on two QDC demonstration systems. One is a magnetic clamping system, the other one will be a hydraulic system. 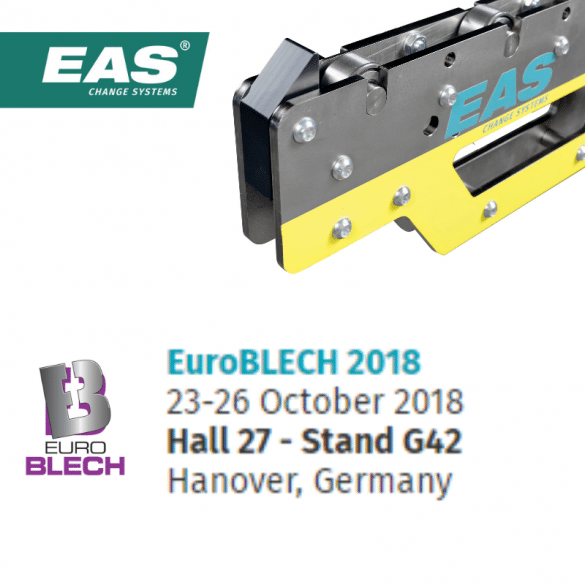 At the EuroBLECH, EAS will also be presenting a motorized pre-roller. Saving time and offering safer working conditions. Operators do no longer need to handle heavy dies or casts in and out of presses, reducing the risks of trapping or even crushing body parts. The range of pre-rollers vary from fixed rollers – easily switched from one machine to the next, and swiveling rollers, to motorized rollers. When pre-rollers are driven by a special push/pull motor, even the heaviest of tools are loaded in an instant, with the safest working conditions possible. Even in places difficult to access, quick and accident-free die changes are within reach. An electric drive pushes and pulls the die in and out of the machine. EAS demonstrates a set of motorized pre-rollers at EuroBLECH stand G42 in Hall 27. The scope of clamps is complemented by a wide range of die lifters. These die lifters are available as ball lifters and as roller lifters, actuated either by spring force, air or hydraulic pressure, depending on the load to be moved. If you want to follow-up yourself, please call our head office: 0031 318 477 010.